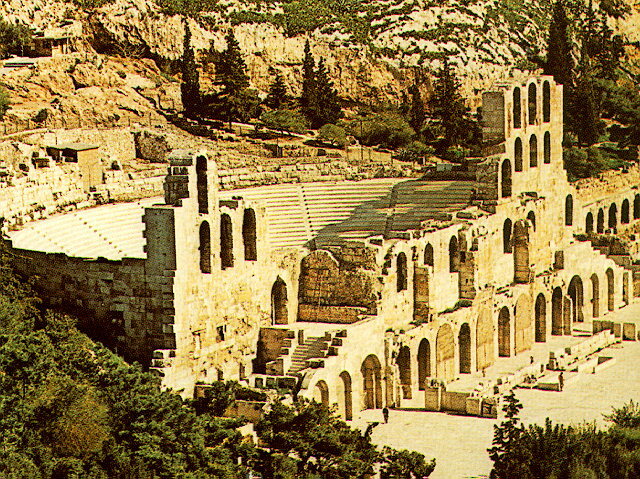 The Odeion of Herodes Atticus. It was the third Odeion to be built in Athens, after the Odeion of Perikles and that of Agrippa. It was erected by Herodes in memory of his wife Regilla, who died in A.D. 160. It is shaped as a semicircular theatre, with a radius of 38 m., and could seat around 5,000 people. The facade, 28 m. high, was massive, having a width of 2,40 m. The wall of the skene was lavishly decorated with architectural elements. The Odeion was destroyed during the invasion of the Herulae who also destroyed most of the city's monuments in A.D. 267.